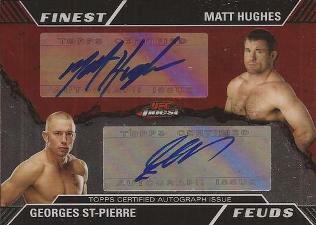 Following initial sales, dual autographs, autographed memorabilia cards and one-of-one Refractors are leading the way for 2011 Topps UFC Finest. 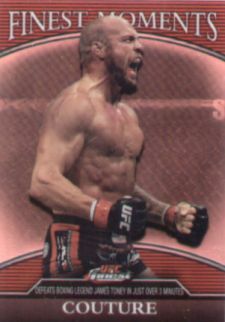 A Finest Moments Randy Couture 1/1 Refractor closed on eBay at $332. Other hot cards include a Finest Feuds dual autograph featuring Georges St. Pierre and Matt Hughes ($299), a redemption for a dual Couture/Chuck Liddell autograph ($287.50), and a Finest Feuds double autograph of Jens Pulver and B.J. Penn ($275).